5 weeks of literary analysis lesson plans for Dr. Jekyll & Mr. Hyde by Robert Louis Stevenson. Includes pacing guide, pre-reading, film essay, activities, reading quizzes, notes, posters, author study, character analysis and discussions. 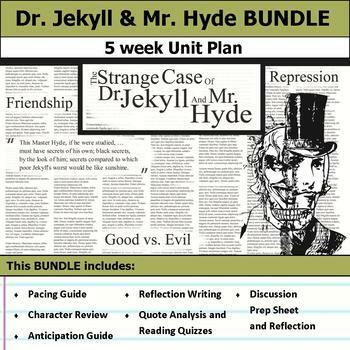 This unit plan contains everything you need to add relevance and rigor to Dr. Jekyll & Mr. Hyde in an engaging way!